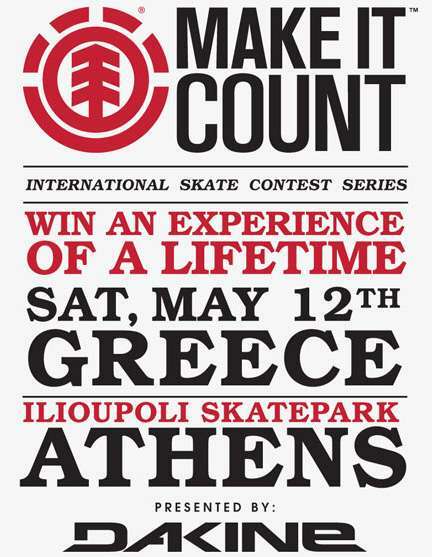 Element's Make It Count contest does a comeback for 2012 in Greece at Ilioupoli's skatepark. It is an international skate contest series where the national overall contest winner will travel to Berlin to participate in the European finals. The European winner will be sent to the global finals, where they will stay at Element YMCA Camp and get the chance to compete for a one year Element sponsorship. There will be three age divisions 13 & under, 14 to 16 and 17 & up on a jam session format. Prizes will be awarded for every zone and every division. Entry fee is one canned food time, where all canned food will go to local good banks.